It’s a common problem, particularly in older homes: the need to update a tired kitchen space with the constraints of a post-purchase budget. Or, the desire to maintain some original features at war with the need for a better functioning kitchen. We’ve found inspiration for your kitchen refresh with simple, crafted tweaks à la Avondale’s Winslet & Rhys. The store’s kitchenette is a lesson in modern ideas coexisting with older ones. 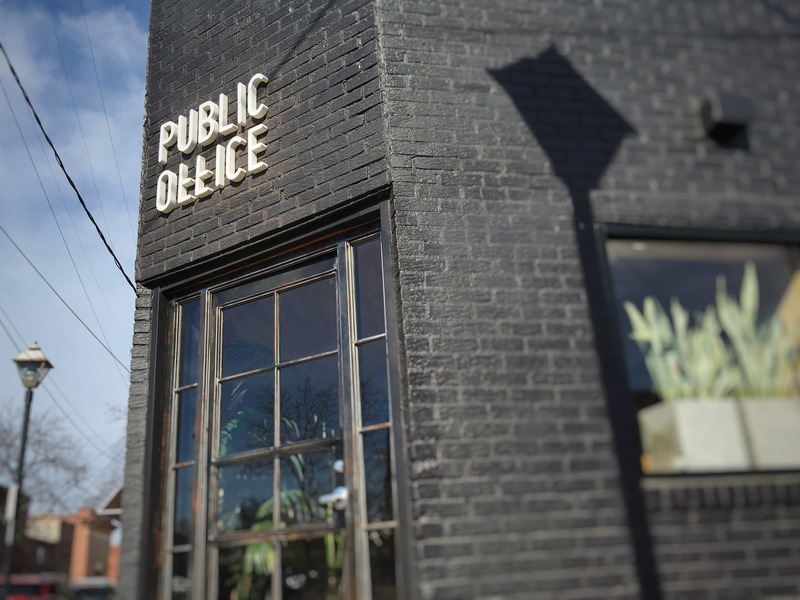 It’s Avondale’s last-century charm filtered through a spare design eye. And it absolutely works. Winslet & Rhys’s cabinets are new and streamlined, but what really makes them special is the color. The lovely deep, true blue of the shop’s base cabinets would spruce up existing cabinetry — either of the too-worn original or the used-to-be updated variety. A good paint job truly goes a long way. It may seem counterintuitive, especially since we just suggested paint, but hear us out. If you’re facing sad laminate countertops or tile that’s seen better days, consider replacing it with wood. This Old House has a whole feature on the practical considerations. Short of marble, though, wood is probably your best blending of modern tastes and classic materials. And with its lower price point, you may have enough budget left for a modern waterfall edge à la Winslet & Rhys. Just bear in mind that deeper wood stains will look more old school, and pale woods err more Scandinavian modern. Open shelving is a trend with staying power, but Winslet & Rhys uses large-scale pegboard for a clever twist. Replace uppers with open pegboard shelving for a solution that feels charmingly crafted, not to mention flexible. As an added bonus, the pegboard anchor is also a stylish substitute for a standard tile backsplash. 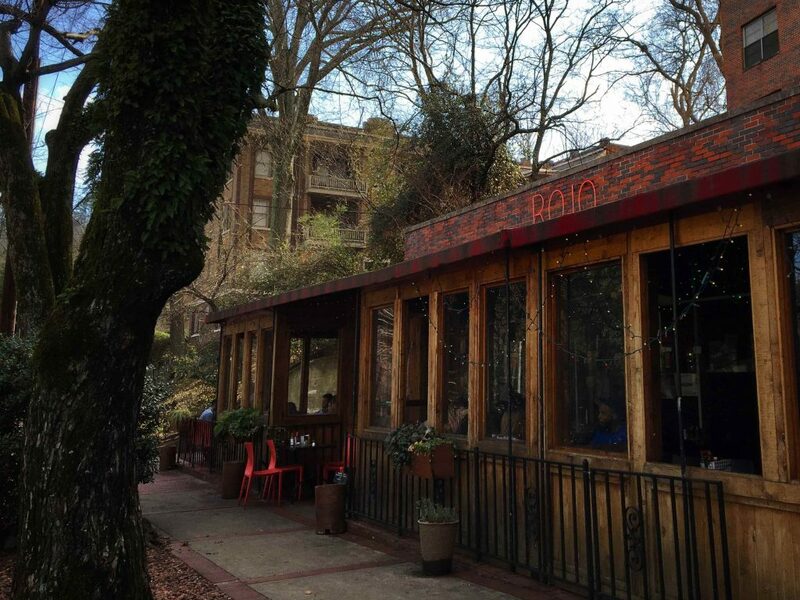 It’s no secret we love this neighborhood gem. We included it in both our neighborhood roundup and an ode to its weekend-long brunch service. 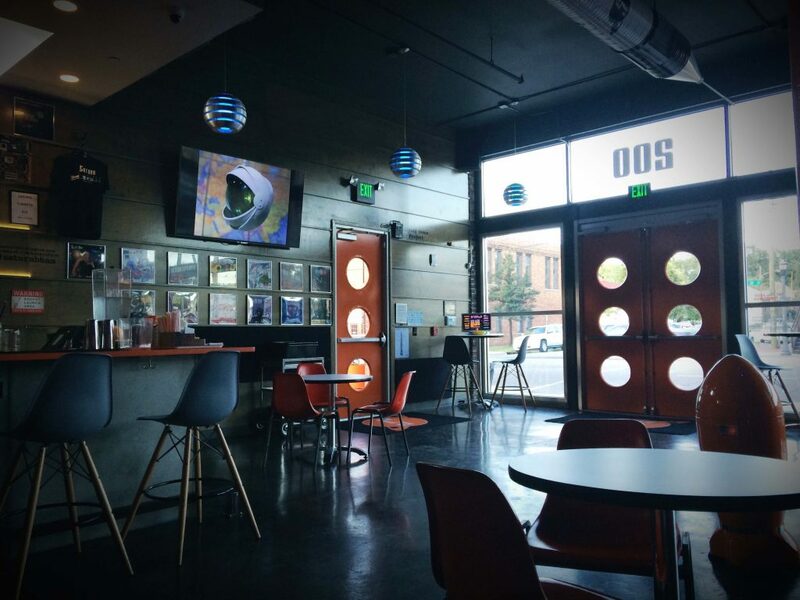 But we also love the feel of it, the way its tree-lined location, full bar, and interior stylings create an excuse to linger. So, how do those interiors create help create the Rojo in Highland Park we know and love? And more importantly, what lessons can they offer for your home, in Highland Park or elsewhere? When we first considered a post on Rojo’s style, we thought artsy, eclectic, almost Five Points South in feel. But when we revisited photos of the restaurant’s actual interiors, we realized parts of it are downright stately. What we came away with is an approach for making even the grandest homes feel relaxed and fun based on Rojo in Highland Park. There are two things that stand out most about the restaurant: its deep red interiors and its large-scale gunslinger mural. Fortunately, both those things are replicable, at least to a degree, while carving out your own casual style attitude. Red may be a bit dramatic for your own home space, and so long as your name doesn’t literally translate to “red,” no pressure. Think about other deep tones — a rich navy, a flirty emerald, a cozy charcoal — all still on point for interior colors, especially in high-ceilinged historic homes. Just don’t leave those ceilings white if you’re looking to replicate Rojo’s cozy feel. Houzz has a compelling argument for black ceilings (like Rojo’s), but there are plenty of Pinterest options involving a single deep wall, ceiling, and trim paint color. Then there’s that mural. The combination of bold color and standout art defines the feel of the space, even while keeping the rest of it pretty low key. Large local art won’t be your cheapest accessorizing option. But there are few splurges we feel better about than buying a nice piece during Art Crawl or one of Rojo’s side-room showings. The built-in elements are what make this space most compellingly Highland Park. That iconic gunslinger? He’s surrounded by a wall of built-in bookcases with a simple dark stain. The best trick is how the built-ins frame the art so that it owns the room without occupying all that much of it. Built-ins are the kind of detail that’s expensive to replicated but that well may exist in a historic Highland Park home. In fact, it’s one of the things we love most about them. And while Rojo’s shelves store their extensive collection of libations, yours could just as easily hold books. Perhaps offset with sculptural bookends or the odd accessory piece. Though carving out space for Redmont bottles and small-batch bourbon would be a classy alternative to a bar cart. We’ve said before that Cashio’s Meatball Market is no grandma restaurant, and that still holds true. But that’s not to say it’s absent older influences. In their blog post on the space, design/build firm Appleseed Workshop details its “eclectic mix of styles,” from modern lines to a Sicilian palette. The overall effect is something we think of as Lakeview Modern style, a blend of design eras for a thoroughly fresh feel. The most established strip of Lakeview’s entertainment district–an L-shaped stretch down 29th and onto 7th Avenue South–is a tour through the Mediterranean-style Cashio’s building, the craftsman air of Slice and the Tudor timbers of the Avon Theater. Add in the colorful horizontal lines of 29 Seven, and there’s a distinctly modern bent to the neighborhood as well. It’s not the workhorse that you get with a stone like granite, but Cashio’s proves just how versatile marble can be. From modern wall applications to classic cafe tabletops, Appleseed identifies the native Alabama stone as a key ingredient for an all-new space rooted in tradition. Smooth surfaces would bring plenty of mod attitude but not enough Lakeview charm. Cashio’s splits the difference, breaking up its vinyl seating with tufting on the banquette back and nailhead bar stool trim. Besides an eye-catching tomato red, the space is defined by a single graphic element: an anthropomorphized ball of spaghetti. Its mirror application defies the logic of a traditional frame, but its black-and-white palette keeps things neat. Choose your focal point, in other words, then run with it. We’re taking a look at some neighborhood style icons this week, exploring what makes them work so well and what lessons they can offer their neighbors. Up today is Revelator Coffee downtown, and check back Wednesday for a look at Cashio’s Meatball Market in Lakeview and Saturday for Rojo in Highland Park. 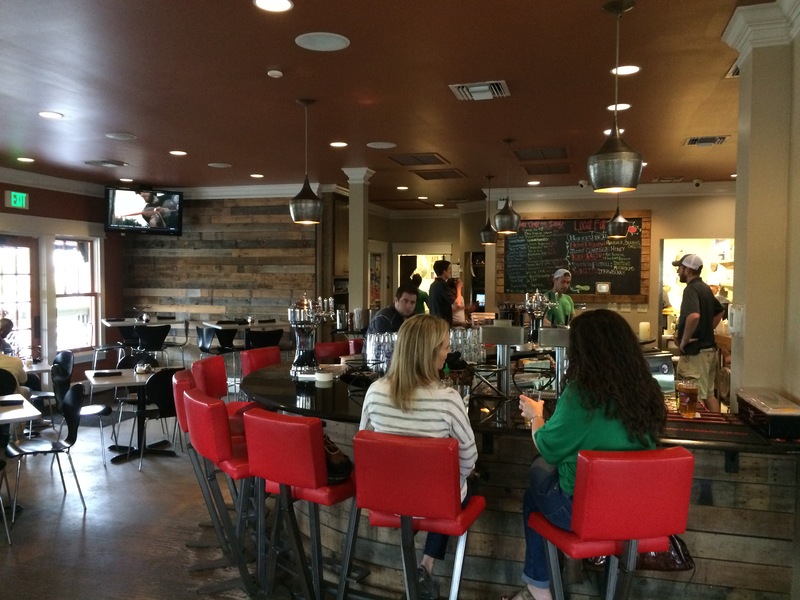 Revelator Coffee has seen a major style evolution over its two years of operation, shifting from a dramatically modern space to a more stylishly homey one. It’s less grandly modern, more cozily mid-mod. Still very stylish, but in a way that’s more accessible. With the rapid expansion of the downtown loft district, we think Revelator’s an excellent muse when developing your own open-plan loft style. To help, we’ve put together a list of Revelator style cues. Multi-purpose tables get pressed into heavy use here. Some of the same laptop tables make an appearance in side chat arrangements, in fact, as in Sky Castle’s lounge-y space. There’s also a clever nesting coffee table that’ll hold a standard spread of books and coffee with a smaller pull out section when you need more surface area. Revelator relies heavily on a series of comfy armchairs in their mastery of flexible seating. Two are in a pretty traditional grouping with the low-slung leather couch. Two others frame the back of the dining area, made purposeful by an elegantly arched floor lamp. The final two take up residence by the door, creating an extra place to sit and chat while dressing up what would otherwise be dead entryway space. Revelator has one big, statement light in the space. It’s a grand one, too, made grander since there’s nothing else competing with it. Simple, linear track lighting brightens the counters and prep space, with framing colors that blend into the ceiling paint choices. Take advantage of natural nooks. Revelator’s rectangular communal table, which is basically a nice mid-century dining table, sits along its bumped-out window bay. The result feels very natural as a defined “space” and takes advantage of great natural light for both eating and functional work surface. Give the kitchen new friends. It’s natural, and in many ways practical, for your dining table to back up to your breakfast bar. There are clear benefits, like natural overflow seating with room to eat. But unless you regularly use it that way–and most of us don’t–you might end up feeling more connected to the rest of your home’s (and guest’s) activity if the living area is closest to the kitchen. Revelator has let their sofa ease toward the dining table for a sense of separate zoning that preserves visual flow. Are you ever drawn in by the siren song of pale wood and natural light that appears so often in Dwell Magazine? It’s lovely to look at, of course, but sometimes you also want to visit. And possibly get a style souvenir. You can now do both at the Public Office in Woodlawn. Another project of Armand Margjeka, Public Office extends his artistic eye from Open Shop to a neighboring corner. It also offers an unlikely mix of skincare, candles, camping mugs, and cutting-edge coffee brewing. It is, in a word, unique. In a way we can’t help but love. There’s something about this little corner of Woodlawn that’s like shopping or eating in someone’s very stylish home. 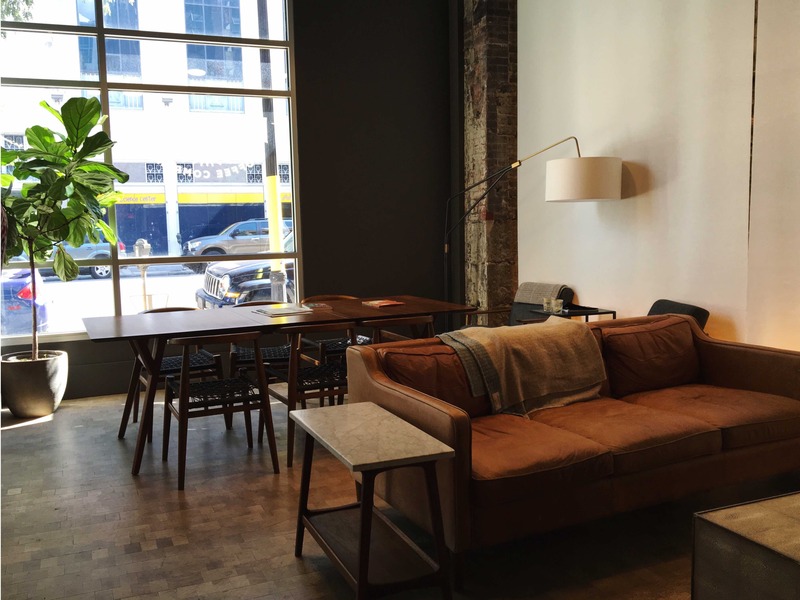 In a way we’d almost expect to go with the loft-y atmosphere and creative minds downtown. Instead, it’s in Woodlawn that folks like Margjeka and the Johnsons of Club Duquette have carved out public homes to purvey some of their personal favorites. It’s a new take on specialty shop, defined, as we’ve mentioned before, as much by personality as product mission. And it works in part because of Woodlawn’s location adjacent to arts-minded communities in Avondale and Crestwood. Visiting Public Office, though, feels like a design moment. As though you should take notes for your next home project. And maybe you should. (We might have.) It’s an exercise in modern character, not just scarcity, like the European approach to overhauling an older building. Instead of reclaimed and industrial, it’s natural and bright. It feels finished, which is a different sort of complement to older architectural styles and a nice alternative to rustic reclaimed trends. We’ve rarely met walls of shelving we didn’t love, and Public Office’s are no exception. There’s a movement afoot in Woodlawn. One less rooted in reclaiming a grand past and more in imagining a small-batch future. Not an either/or proposition, mind, but a well-crafted addition. 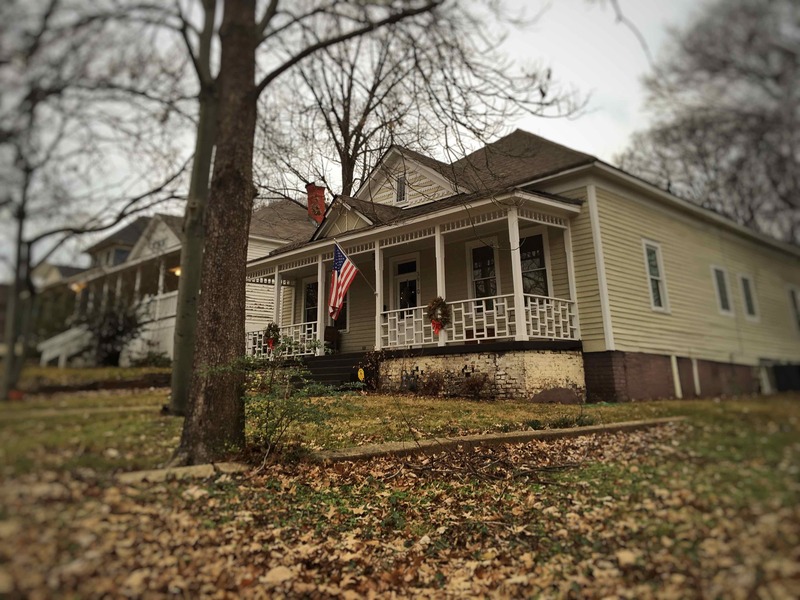 This is part III of our weekend in Woodlawn series. Check out Monday’s post on Woodlawn Cycle Cafe brunch, and Wednesday’s post on Open Shop. There’s a lot happening around Avondale Park. Besides the gothic grandeur of Avondale United Methodist Church, there’s Parkside, the public library, and the slew of hip new options around Fancy’s on Fifth. So you’d be forgiven if you’ve failed to really track the residential architecture nearby. But you really should. Besides the cottage charm along this stretch, the area is also rife with front porch railing inspiration. There’s the alternating ladder style–almost like a brickwork pattern but with negative space–that on its own almost seems too mod for a historic home. Paired with some simpler, classic trim along the porch roof, though, it makes perfect, charming sense. And if you’re trying to marry classic architecture with mod furniture influences, it would be a nice way to carry the theme outdoors. Then there’s the Victorian feel of a neighboring porch. Instead of Stickley simplicity, it has a hint of prim gingerbread. The result is a lovely balance of sturdy bungalow scale and almost lacy delicacy. Fish scale shakes along the front gable tie in to the curvier texture without creating a look that’s overblown. Another classic, tailored look is the wide “X” design down the street, which gives the porch a nice open feel. It’s less practical for the safety of kids and pets, but it’s a lovely look for the right lifestyle. There are even lessons in adjusting the scale of a classic balustrade design for added interest. Extra-wide intervals make a deep porch feel more sunny and open. Extra-narrow intervals add to the petite appeal of the tidy cottage next door. Choose your own porch adventure, in other words, and know you have more options than you may have realized. One of the things we love most about Five Points South historic homes is the wealth of color. It’s a little like living with the everyday version of Painted Ladies, which feels good for the creative soul. But no matter your home’s era, there are ideas to be had here. If you love the idea of true color scheme but have trouble visualizing beyond white, wandering through Five Points South is your ideal starting point. The architecture, full of Victorian and American Foursquare examples, is what makes color so vibrant in these areas. Victorian styles, especially, make use of bold contrast colors to highlight intricate trim details. And since they frequently include a scheme of three or four distinct shades, they offer a broad range of palette ideas. Generally speaking, two of those shades will be in the same family, likely the same paint card. That makes for a simple way to translate elaborate historic color schemes into a more subdued plan. But even on simpler midcentury homes, there’s room for some exterior paint fun. 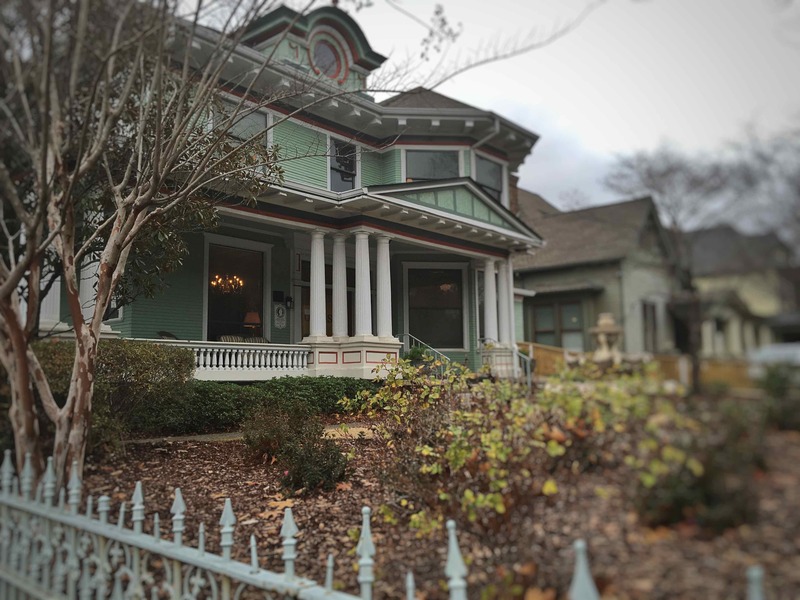 B-metro featured a Homewood craftsman recently with its window woodwork painted turquoise. So feel free to pull a similarly bright hue to accent more minimal architecture. What kind of colors are you likely to find? Greens are popular, from the fresh minty and evergreen combo of the Oasis Counseling Center to softer shades of sage and juniper nearby. Whether in brickwork or trim accents, reds play a starring role. One of our favorite simple palettes is an overcast pale blue with clean white trim and a rosy red door. There’s also a lovely pale gray with charcoal trim and buttery accents. Both of which feel highly accessible for less bohemian neighborhoods. So next time you’re headed for Dreamland, take a Southside winding road ‘till inspiration strikes. The thing we love about Nequette Architecture & Design is their ability to stake out a timeless middle ground in their design projects. They eschew the starkly modern but refuse to be constrained by the past. And as they renovate their own two buildings on Second Avenue North, we asked owner Louis Nequette to tell us about their downtown design process. 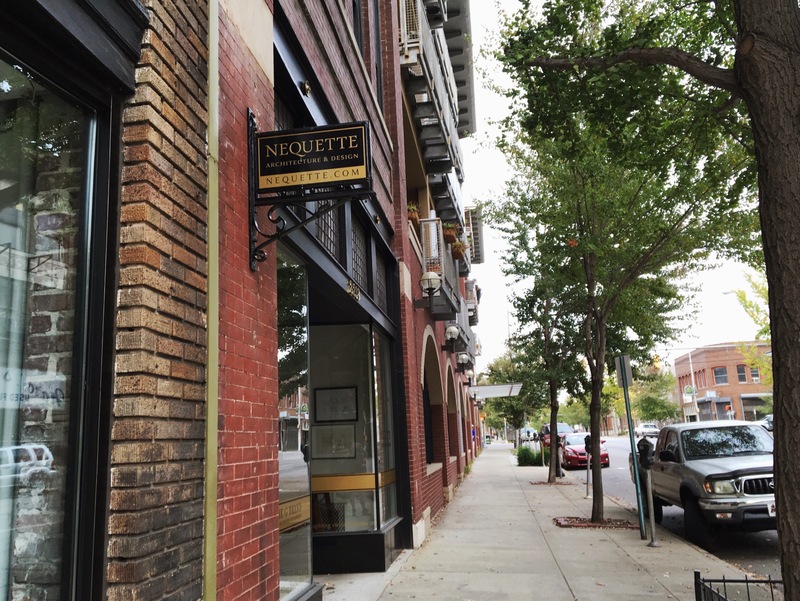 We worked with Nequette to acquire the two former Harold’s furniture buildings, which are more or less across the street from his current rented space. It’ll be a classic loft district mixed-use project — ground-floor retail topped with loft living — with a twist: the firm will be the building’s penthouse resident. The building’s thick industrial walls have enough heft to support an addition, and the one the firm has planned should be stunning. “There’ll be a lot of glass,” Nequette said, to optimize the views. “Sometimes there’s nothing, and it gets demolished completely. Sometimes there’s so much that it really warrants it being a historical preservation kind of project. And then most cases it’s kind of in the middle, and that’s how this one was,” he said. The deciding factor was the addition’s footprint. “We felt because we wanted to pull the top floor up to the front elevation, that that would look more strange and out of place and not in keeping with the character of 2nd Avenue,” he said. “As opposed to doing what we’re doing, which is take a much more traditionally-inspired approach to that design. What does that character look like? Neatly-framed windows that emerge naturally from the building’s existing roofline, with a bay window bumping out over the second building. A hint of modern tension in its asymmetry, but nothing that would give you pause. Looking at the drawings, we were struck by how natural the addition seemed. Which is how we feel about most Nequette Architecture & Design projects. That middle ground we mentioned? It’s a way of designing that feels like it’s always been there, and a result we always love. Avondale’s collection of charming cottages, particularly around its 41st Street corridor, presents a common design problem: blending modern ideas and classic design. And while it’s possible to rock fully modern interiors while maintaining a historic facade, we think there’s another approach that’s worth a try. For modern home style in Avondale, we suggest a visit to Winslet & Rhys. From the graphic peach accent wall to the true blue cabinetry, color gives this modern destination an old-fashioned sense of welcome. So consider adding large swatches of saturated hues to find your balance of original charm and modern touch. Classic homes have a comforting rhythm made up of repeating materials and matching collections. From china displayed in glass-fronted buffets to the texture of chunky moldings, older homes create balance in repetition. Winslet & Rhys is able to do something similar, of course, because it’s displaying objects for sale. So there are delightful rows of freedom soaps or gold-accented cocktail glasses. Still, it’s worth considering the idea of a collection. 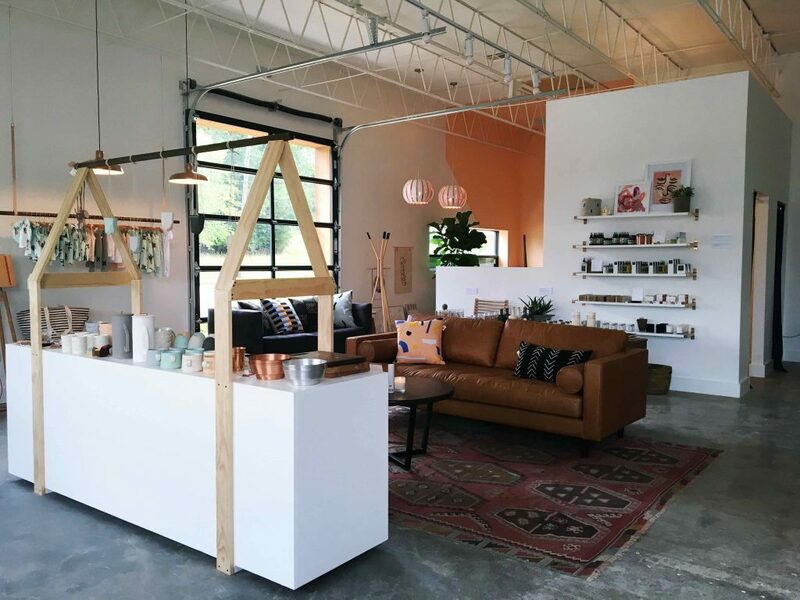 It’s not hard to imagine the store’s tan leather sofa, worn Oriental rug, and unfussy accent pillows cozied up near a brick fireplace surrounded by built-in shelves. Or the subtle ridges of a Plenty Design Coop chair playing well with classic moldings. The consistently pale woods and the brass bracketed-shelves feel finished. 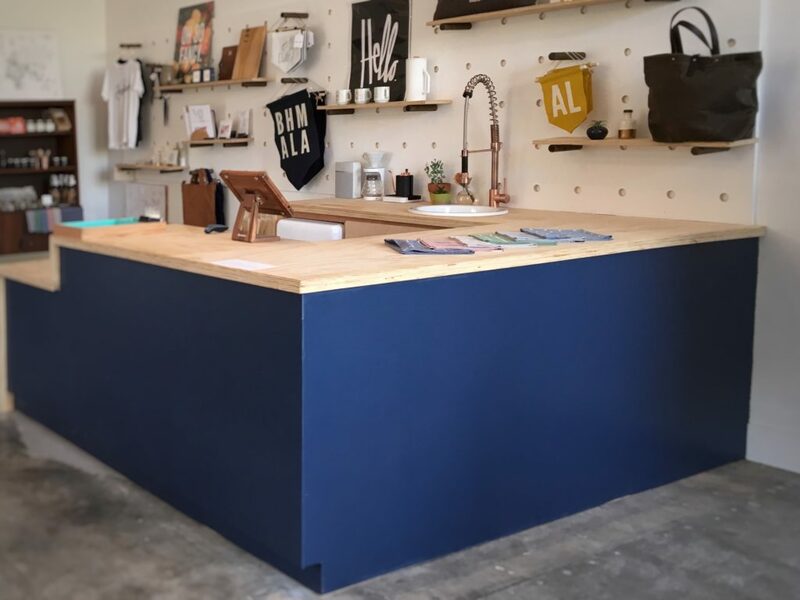 Despite the shop’s industrial bones, there’s not a reclaimed wood in sight. Instead, its thoughtful designs create an understated elegance fit for classic architecture. Which brings us to the not-so-secret secret of Winslet & Rhys’s classic-friendly modern style: the craftsmanship is what makes it versatile. Its blend of good ideas and human touch. Because even if you’re ready to knock down walls and modernize a floor plan, you still need elements that connect with the home’s original spirit. Handmade details are the ultimate connecting fiber.